Another Major currency pair, the GBP/USD pair is cross between the British currency (British Pound sterling) and the currency of the USA (U.S Dollar). Any currency pair consists of a base currency (in this case, the British Pound) and a quote currency (in this case, the U.S Dollar). Trading this pair is commonly known as trading the “cable”. When performing currency trading activities in binary options, a trader will look at the market price of the pair that he/she wishes to trade. If the market rate for the GBP/USD pair is 1.7065, this means that it takes 1.7065 US dollars to buy 1 British Pound. Factors which commonly affect and influence the GBP/USD pair include the interest rate contrast between the U.S federal reserve and the Bank of England. It is important to note that the Bank of England affects the GBP/USD more than the U.S federal reserve does, because of the bond purchasing index (and any interest rate decisions) scheduled and released on the first week of each month, by the Bank of England committee. This makes the pair more volatile than the EUR/USD for instance, causing spikes which could cause problems for binary options traders who do not prepare for them by reading relevant news and compiling a GBP/USD forecast by consulting charts, which would take any headache away when performing currency trading . The currency pair can also be negatively influenced in its correlation with the USD/CHF pair, but positively affected by the EUR/USD pair. 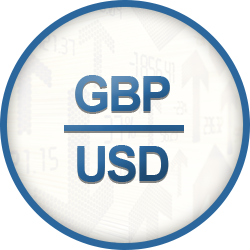 On this page, you can find all of the relevant GBP/USD charts which will help you put together a GBP/USD forecast, helping you make more informed decisions for your currency trading activities.